Alex Honnold took his free soloing to a new level when he climbed the Regular Northwest Face route on Half Dome without a rope. Very impressive, yet kind of scary because what else could be next besides an El Cap free solo? Paul Robinson had a slow start to his rampage in Europe because of bad weather. With conditions improving from rainy to hot, he has made quick ascents of several hard problems in the areas of Magic Wood and Chironico in Switzerland. So far 2 V13s, 5 V12s and 2 V11s are in the bag with countless harder problems remaining for when conditions get better. If you are at all interested in the high end grading debate you should read Paul’s latest blog entry where he gives his thoughts on the grades of the problems he has climbed thus far. I agree with Jamie’s comment that if he disagrees with a given grade it would be beneficial for Paul to register his thoughts on the all important spraysheet, however I understand his reservations with doing so. 8a.nu has created an environment on their site that is not conducive to a civilized debate these days. 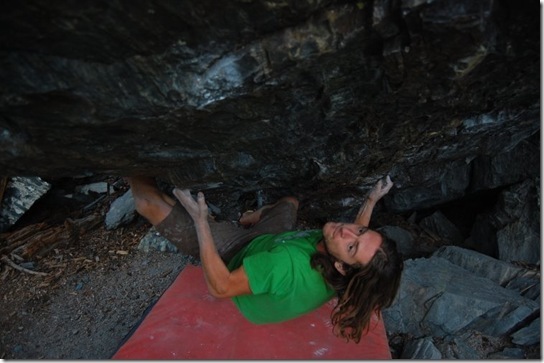 Props to James Pearson for pulling off the flash of a couple of these debated V13s. There has been a lot of development going on in the Eastern Sierra Nevada area Way Lake located north of Bishop, CA. Strong women like Lisa Rands, Beth Rodden and Lyn Verinsky have been pulling down in a big way. Just recently, Isaac Caldiero opened one of the hardest lines when he did Chumscrubber (V12). The crew from Betabase has been up there as well. Also on the scene for the media capture was John Vallejo. The video of Alex Johnson crushing some alpine boulders is now up on MomentumVM. The 2008 Reel Rock Tour got underway last night in Boulder. Based on the review on AllClimbing it sounds like a great event. The winners of the Reel Rock Tour Filmmaking Competition were “Back on my Feet” and “Chalk it Up” in the so-called action/inspiration category and not surprisingly “Rediness is All” in the humor category. Looks like local favorite Emily is getting her nightmare wish granted to take her “dirt me!” tour nationwide. Check the listings on their site to see when the tour is coming to a city near you. The Nor’easter festival is coming up September 26-28 at Tenney Mountain in Plymouth, NH. Climbers like Chris Sharma, Dave Graham, Daniel Woods, Tommy Caldwell and Kevin Jorgeson will be in nearby Rumney for clinics and of course hard sending. Check the Nor’easter website for some interesting write-ups on the athletes who will be participating in a Flash and Redpoint bounty comp on the Saturday of the event. The big bounties are offering $1,000 to anyone that can repeat Jaws II (5.15a) and $2000 to anyone who can claim the FA of the so-called Bill Clinton Project. 24 Hours of Horseshoe Hell is coming up the same weekend as Nor’easter in Arkansas. 24 straight hours of clipping bolts!! Rocktoberfest is quickly approaching at the Red River Gorge in Kentucky. Check out the official website for more information and to register. Unless our plans change suddenly, Mrs. Narc and I will be there. Hopefully we will see some of the Climbingnarc.com faithful down there. ← May I Buy You A Compass? If you could give me a couple of your 8b’s I could use the points! i be taking ALL your 7Bs… by gunpoint, kungfu kick, white collar book cooking, extortion, bribery, clepto piecemeal stealing… all that. sweaty: i dabbed on contacting your friend. sorry. things were crazy at week’s end. frittering time is not good.